It is with great sadness that we announce the passing of our dearly beloved Mother, Grandmother, Great-grandmother, Sister, Aunt, and friend. Margaret is survived by her sons, Brian (Diane), and Tim (Gail), grandchildren, Brian (Carly), Gerald, Brent (Lisa), Grant, Jason, Chris, Andrea (Patrick Robinson), Garth, Alyssa, 9 great grandchildren, brothers, Don (Helen), Graham (Brenda), and Gene (Rita) Powell, sister, Muriel McGuire, sister-in-law, Evelyn, and many nieces, nephews, and friends. She was predeceased by her dear husband, Ross, her brother, Gordon Powell, and sister, Marion Covey. Margaret was born in Goderich, Ontario, on January 24, 1932, and moved out west where she met her husband, Ross, with whom she enjoyed a very full and wonderful life. Together, they enjoyed camping, fishing, curling, travelling, golfing, and dancing, and especially liked to share in their pastimes with their family and friends. Margaret was an artist, crafter, baker, and very much the heart of our family, organizing celebrations, and hosting family gatherings. 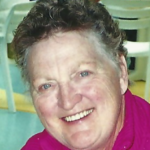 She was a past honored lady with the Canadian Royal Purple Society (North Kamloops Lodge), and an active parishioner of the St. George’s Anglican Church, North Kamloops. She passed away on May 20, 2018, in Kamloops, B.C., and leaves behind a very strong legacy of compassion and kindness for which she will always be fondly remembered. We wish to thank all of the nurses, doctors, and staff at the Royal Inland Hospital for their support. A memorial service celebrating her life will be held at St. George’s Anglican Church, 308 Royal Avenue, Kamloops, on Monday June 11 @ 11 am. Our hearts go out to all of you during this very sad time with the loss of your dear Mother / Grandmother and Great Grandmother. She will be truly missed by all who knew her for her kind and loving way. We are sending OUR Hugs to all the Norris & Powell families at this time. So sad to hear of Aunt Marg passing. I have “many fond memories” of her & Uncle Ross. Looking back..I “feel so blessed” they were able to attend our wedding in Ontario..34 yrs ago! As well as having the opportunity to meet all of you, and sharing good times together.. while I lived with Auntie Marg & Uncle Ross in the early 80’s!